Three Dangriga men charged with murder for the gruesome death of Honduran national Rodolfo Villatoro walked down the steps of the courthouse building in Dangriga yesterday, free men after they were found not guilty of the charge in the Supreme Court Southern Session. The men are Nicodemus Rodriguez, Gilbert Lamb and Guillermo Martinez, who had been in custody since April 2009.The trial judge was Justice Denis S. Hanomansingh. Police reports are that around midday on April 9, 2009, the body of Rudolfo Villatoro, who was living on Samwood Street, Dangriga, was found in the outdoor latrine in his yard, which is behind Habet Hardware in Dangriga Town. 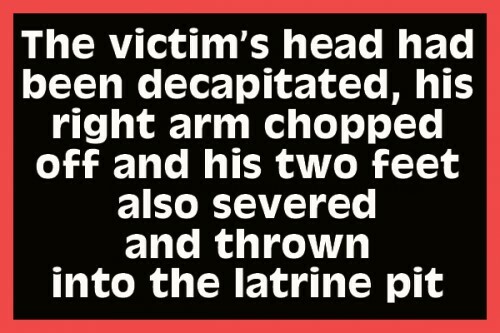 His head had been decapitated, his right arm chopped off and his two feet also severed and thrown into the latrine pit. The scent of rotting flesh had been tormenting the neighborhood. A neighbor who went to his home to find the origin of the odor went to the latrine, where the decapitated body was found. Police were then called. Dangriga police made the gruesome discovery around midday in the abandoned outdoor latrine on Samwood Road. Villatoro had last been seen socializing with three other men, including a minor from Dangriga. Police believe the motive for Villatoro’s vicious killing was robbery, because a substantial amount of money which he had in his possession, along with a thick gold chain and bracelet, were missing. Inside a house in the same yard police found a handsaw that was bloodstained. The house is also where the minor resides and police detained him and afterward arrested two more men who they believe were the men who were socializing with Villatoro and eventually killed him. They believe that Villatoro was lured to the minor’s house because they knew each other, and that was where the attack occurred sometime that Monday night. According to police, in the course of the trial of the three men, a no-case submission was made by Gilbert Lamb’s lawyer, who told the court that no evidence pointed to Lamb or implicated him in the heinous crime, and the charge was then withdrawn against him. The case against the two other men, Nicodemus Rodriguez and Martinez, fell apart when the main witness told the court that she saw the two men with another man, but could not say if that person was Villatoro. About 10:00 a.m. yesterday morning, the jury of 12 went into deliberation in the jury room, and about 1 o’clock yesterday afternoon, they returned with a not guilty verdict. Gilbert Lamb, 22, was represented by Arthur Saldivar, while Tricia Pitts-Anderson represented Guillermo Martinez and Nicodemus Rodriguez was represented by attorney Oswald Twist. The verdict leaves the case of the brutal murder of Rodolfo Villatoro unsolved.